1. What is Physical Intelligence? Walking represents an extraordinarily complex coordination of actions, delicately tensioned between balancing and falling. Once mastered, we walk with hardly a thought-on varied terrain, at different speeds, while carrying heavy objects, and in conversation with others. In walking, the entire body-head, spine, torso, arms, legs, hands and feet work together in rapport with the physical conditions-gravity, ground, spatial relationships­­­-to propel us forward. Contrary to conventional understanding, it is not the skeleton that walks, but a whole-body web of tissue, stretching and contracting to harness the potential energy available. Physical intelligence coordinates this complexity. With so many variables, many strategies are possible. 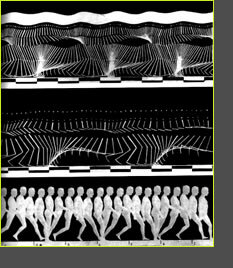 Thus, the pattern and rhythm of our gait is highly individualized. And, though locomotion can be nearly effortless, we can and do get in its way. Week 6 we will experiment with the biomechanics of walking, looking specifically at the contribution of legs, arms and spine to see if we can experience what seems a mundane activity in new ways. Using LED target markers on the body for reference points, high-speed video and movement analysis software allows us to distill the individual characteristics of each person’s gait. With this information, we will experiment with the range of movement patterns revealed to gain perspective on our individual strategies. A visit to MIT’s Leg Laboratory to compare and contrast the physical intelligence an organism demonstrates against that of artificially intelligent machines.